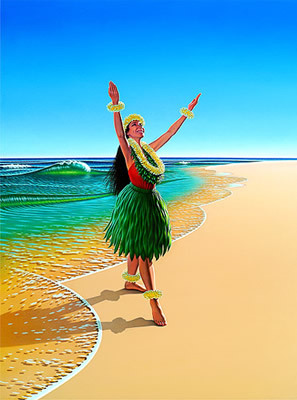 This painting has become one of Alex's more familiar works, seen throughout Hawaii on the cover of the statewide Paradise Pages phone book. Painted on canvas, Aloha! is the only painting ever chosen for the Paradise Pages cover. The detail on the left, below, shows the dancer's feet magnified to approximately the size of the original painting. Dimensions of Original: 18" x 24"